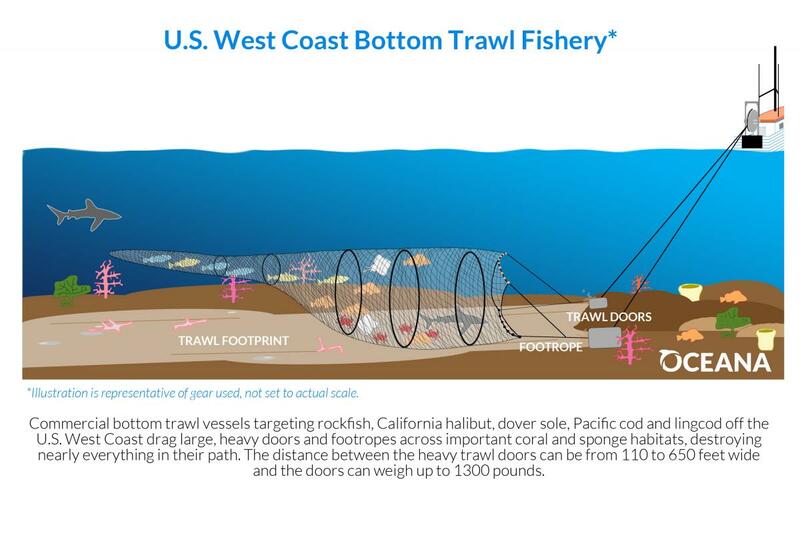 Bottom trawling destroys far more ocean habitat than any other fishing practice on the West Coast. In this fishing method, large weighted nets are dragged across the ocean floor, clear-cutting a swath of habitat in their wake. Some of these scars will take centuries to heal, if ever. For example, hard corals in Alaska have been dated to be hundreds to thousands of years old, and radio carbon dating on the oldest known deep sea corals indicates they are 4,200 years in age. Yet, these pillars of the ecosystem can be destroyed by one swipe of a bottom trawl. A bottom trawl consists of a large tapered net with a wide mouth and a small enclosed end. The mouth of a trawl net has two weighted doors that serve not only to keep the net open, but also to keep the net on the ocean floor. These doors can weigh several tons. In addition to the heavy doors, the bottom of the net is a thick metal cable (footrope) studded with heavy steel balls or rubber bobbins that effectively crush everything in their path. As the net drags along the seafloor, living habitat in its path is crushed, ripped up, or smothered as the seabed is turned over. 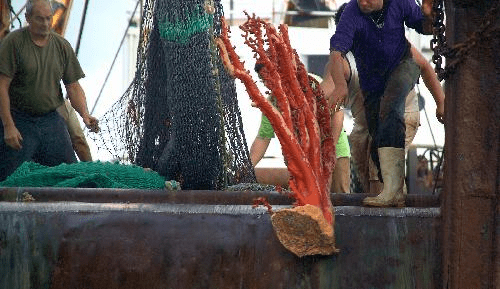 According to the National Academy of Sciences, bottom trawling reduces the complexity, productivity, and biodiversity of benthic habitats--damage is most severe in areas with corals and sponges. When disturbed by bottom trawling, as much as 90 percent of a coral colony perishes, and up to two-thirds of sponges are damaged. Additionally, in recent coldwater coral studies, a review of damaged areas seven years later revealed no new growth. Even in soft sediment habitats, bottom trawling can cause irreversible damage. A study in 2012 entitled “Ploughing the deep sea floor” found that bottom trawling fundamentally altered the chemistry and geology of soft sediment habitats, permanently impacting the biological function and composition of these ecosystems. The damage from bottom trawling is not limited to habitat destruction. As the net drags along the seafloor, all creatures in its path—fish, animals, marine mammals, plants, and turtles—are scooped up along the way. The fishing vessel keeps the targeted commercial species and discards the remaining, unwanted fish and animals—virtually all of it dead or dying. Once coral and sponge communities are destroyed, commercial fish and other species dependent on them for spawning, shelter, nurseries, protection, and food, may also disappear. In addition, overfished species such as rockfish and crab may need corals and other seafloor structures to provide appropriate habitat for recovery. Continuing to implement conservation measures is needed and practicable to ensure bottom trawling does not destroy coral and sponge habitats.